March’s jobs gains, released this morning, mark 66 straight months of significant positive jobs growth in the U.S., with nearly three times as many jobs added in March 2016 compared to March 2015. Each month, many thousands of workers across the U.S. lose their jobs, while others find themselves newly employed. The net number of jobs created or lost in all this activity is an important indicator of the nation’s economic health. But the raw number of jobs created or lost from one month to the next doesn’t say much about the underlying economy. Rather, many of these month-to-month changes are the result of predictable seasonal fluctuations. For example, the fact that the last ten Januarys witnessed the economy shedding over 2.5 million jobs simply reflects the fact that retailers slow down after the holidays and says nothing about broader economic performance. In my paper “Unseasonal Seasonals?” I argue that a longer window should be used to estimate seasonal effects. I find that using a different seasonal filter, known as the 3×9 filter, produces better results and more accurate forecasts by emphasizing more years of data. The 3×9 filter spreads weight over the most recent six years in estimating seasonal patterns, which makes them more stable over time than in the current BLS seasonal adjustment method. I calculate the month-over-month change in total nonfarm payrolls, seasonally adjusted by the 3×9 filter, for the most recent month (column Wright SA). The corresponding data as published by the BLS are shown for comparison purposes (column BLS Official). According to the alternative seasonal adjustment, the economy gained 190,000 new jobs last month, compared to the official BLS total of 215,000. Data updates released today for prior months also reveal some differences between my figure and the official jobs gains from prior months. The official BLS numbers for February were revised up from 242,000 to 245,000 new jobs; my alternative adjustment shows the total actually falling slightly, from 261,000 to 258,000 new jobs. For January, the official numbers were revised down slightly from 172,000 to 168,000, leading my alternative seasonal adjustment to be revised down from 109,000 to 100,000. On net for January and February, official jobs gains were revised down by 1,000, while my alternative seasonal adjustment revised down by 12,000 jobs. The discrepancies between the two series are explained in my paper. In addition to seasonal effects, abnormal weather can also affect month-to-month fluctuations in job growth. In my paper “Weather Adjusting Economic Data” I and my coauthor Michael Boldin implement a statistical methodology for adjusting employment data for the effects of deviations in weather from seasonal norms. This is distinct from seasonal adjustment, which only controls for the normal variation in weather across the year. We use several indicators of weather, including temperature and snowfall. We calculate that warm temperatures and the lack of a major snowstorm in March added roughly 14,000 jobs (column Weather Effect), on top of a February jobs level that was itself inflated by unseasonably mild weather. Controlling for the effects of unusual weather produces a weather-adjusted figure of 201,000 new payrolls in March (column Boldin-Wright SWA), down from the official number of 215,000, but still yielding significant positive jobs growth. At some point over the next few months, the weather effects are likely to turn negative as temperatures and snowfall return to their seasonal norms, because the model ties the level of employment in a given month to unusual weather in that month. Our weather adjustments are designed to be able to see through transient weather-induced effects, both positive and negative, and to be used to gain a better handle on underlying job trends in the economy. a. Applies a longer window estimate of seasonal effects (see Wright 2013). b. Includes seasonal and weather adjustments, where seasonal adjustments are estimated using the BLS window specifications (see Boldin & Wright 2015). 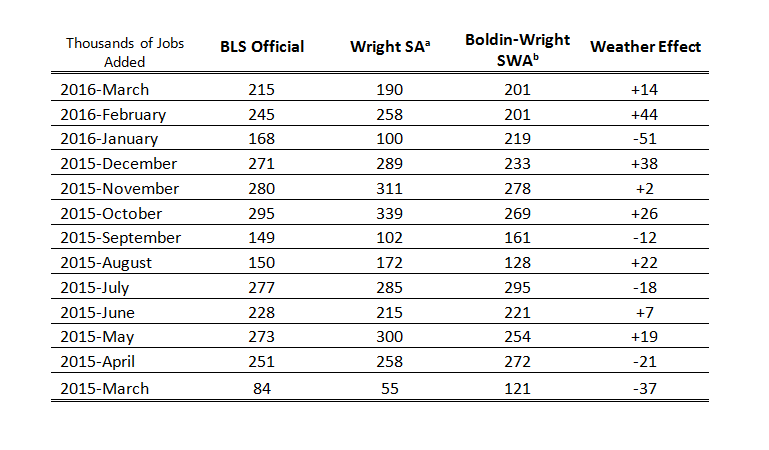 The incremental weather effect in the last column is the BLS official number less the SWA number.